Sitting in the Ed Sullivan Theater’s comfy chair a stone’s throw away from a childhood idol of mine gave me something that I’d not experienced in years: a euphoria that made me feel eight years old again. As a kid, I had to sneak glances of David Letterman — then on NBC in his original Late Night foray — because, well, late-night talk shows don’t often mesh well with a child’s bedtime schedule. So I’d get creative, purposely falling out of bed to “wake myself up” and go into the living room to watch as much of the show as my mother would allow. When my parents gave me a hand-me-down television for my room — a 9-inch, non-HD number — I quickly discovered a new way to sneak my nightly dose of Dave. I’d turn the brightness and contrast all the way down, put tape over the power light, and then plug headphones into the TV — yes, it had a headphone jack — and act like I was sleeping while hearing the misadventures of Larry “Bud” Melman, Biff Henderson and, of course, the occasional Abe Vigoda. I can’t remember where the fascination with Letterman began, only that I’d been watching him since before I could remember, before I could walk. Some 30-plus years later, I found myself in an unlikely situation — standing at the corner of 53rd and Broadway in Manhattan, with a ticket to the Late Show in hand. The show’s pages decided to seat me in the third row, on the end, which makes for good visibility for both me and the TV cameras. As we were being ushered to our seats, longtime announcer Alan Kalter is warming up the crowd, talking more than I’ve heard him in a month’s worth of shows. Kalter pauses and lets that sink in for a minute. Laughter breaks up the inevitability of Kalter’s comment, the truth contained in that joke that makes it funny in the first place: Dave’s days — at least on television — are numbered, and with it a part of my childhood and so many others. After this humorous death threat came the familiar formula of the late-night audience adventure: the person warming up the crowd (Kalter, in this case) then introduces the CBS Orchestra, one member at a time, and the group fires up a jazzy number for a good minute before bandleader Paul Shaffer runs out to join them. After that, you expect the band’s music to end, the announcer to start counting down the start of this “live” taping, and the familiar beginning to the show we see once the local news signs off. Instead, Kalter introduced Letterman before the show. The 67-year-old former weatherman — wiry and gray, yet youthful in presence — runs out to raucous applause, swinging his microphone like a lasso as it bumps a poor Panavision camera. But Dave doesn’t care. His smile lights up the room, and the applause eventually dies down, replaced with anticipation. Without a suit jacket, Dave props himself up to the camera, asking everybody how they’re doing and graciously thanks everyone for being there. It’s at that point he spots a familiar sweater and stops. Dave, an alum of that school as well, looks at the woman. Then Dave starts asking if anyone has any questions. People are thinking, shifting in their seats. Laughter echoes through the theater. A stagehand tells Dave they have 45 seconds until the start of the taping. Letterman talks to a woman from Modesto, California — a farmer — and he asks her what she grows. “Peaches, ‘ammonds,’ things like that,” she said. Dave stops amid a few laughs. The audience laughs loudly, and, after a few more questions — much longer than 45 seconds — Dave thanks the audience again and jogs off the set as quickly as possible. And just like that, the show began. What followed was mostly what anybody could watch through CBS’ website, YouTube clips and synopses on fan sites: hilarious awkwardness with Joaquin Phoenix, a touching moment with comedienne Cristela Alonzo and an unforgettable performance by the Rev. Al Green. There’s a realization that all this will be a time capsule of sorts next year. 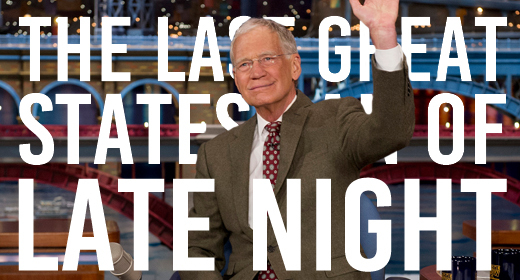 Once Letterman retires, late night as we knew it will cease to exist. Many would argue Johnny Carson set the standard. Early on, Letterman even admitted Carson’s staff had rules for NBC’s Late Night show before it could even get on the air: only a limited number of monologue jokes would be allowed and only certain guests could appear on the show. His sidekick, musician Paul Shaffer, wasn’t allowed to have certain instruments in his band, presumably so they didn’t appear similar to Doc Severinson’s Tonight Show band. Letterman agreed, in deference and respect to Johnny. Then, as Carson abruptly announced his retirement, all eyes settled on the Tonight Show and who would have it. Writer Bill Carter wrote about the legendary feud between Jay Leno and Letterman that ended with NBC choosing Leno, and Letterman moving to rival network CBS. Now, Leno is gone and newcomer Jimmy Fallon embraces that 18-35 demographic with more of a focus on social media and skits in which the audience and guests can participate. The growing social media presence also widens the gap between those who have and haven’t fully embraced the technology. Letterman isn’t on Twitter, nor does his show have a presence there, at least since 2011. His Facebook fan page pushes web exclusives and YouTube clips from the show, but isn’t as aggressive as Fallon or ABC’s Jimmy Kimmel. Letterman’s technique: laughs equal ratings, and ratings equal stability. True wit to go along with that laughter has earned him the respect of comedians young and old alike. Spend thirty seconds watching Letterman at work, and you’ll find that his kind of interview technique is almost non-existent in this generation of talk-show hosts. Many critics said Leno would use cue cards during his interviews, going from one pre-arranged topic to the next, with little in the way of observational humor. Some speculate that Fallon looks for viral moments in his guest interviews, with his questions geared more toward page views than laughs. By contrast, Letterman listens and reacts to his guests, a technique that often brings out the best in them, at times going from charming to controversial in the space of a sentence or two. In that, he demonstrates perhaps his greatest quality: the ability to listen and respond quickly, and at times, be silent and let the guest speak for (and sometimes hang) themselves. It’s a sign of the utmost respect he has for those he invites onto his show. Paul doesn’t miss a beat. “No, me,” Dave said, smiling as the interview continues off the rails. The segment ended up as one of Late Night’s classic moments, one now shown to a whole new audience through YouTube, where the various clips combined have garnered over a million views. Maybe Letterman doesn’t want a show filled with forced viral moments and interviews that only serve as a public relations vehicle for that actor’s film or television show. Maybe going out on a high note is a more honorable thing than conforming to something with which he doesn’t agree. Unless Carter pens another classic, we’ll likely not learn the motivations behind the last great statesman of late-night’s absence from the airwaves. Personally, I think Dave is getting more introspective as his time gets shorter on the Late Show. His time spent with the audience before the show — something neither Conan O’Brien nor Fallon does — speaks volumes about the character of a man we’ve invited into our homes for 32 years. It also projected something to the audience that longtime viewers have been able to see for years: Dave is his own harshest critic, pushing himself constantly despite the collapse of a childhood dream to host the Tonight Show 23 years ago. And so with fresh eyes, I watched the very show I attended in a hotel room in Manhattan, still trying to remember everything I’d experienced. Then Dave ran out, took a bow, waited for the applause to die down, and said something that brought a genuine smile.